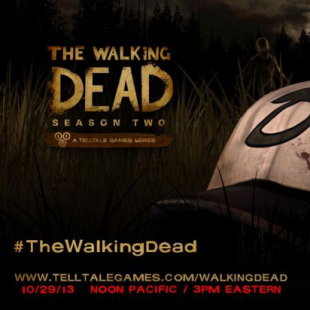 Fans of The Walking Dead should keep their eyes on Telltale for an announcement on October 29th. Telltale's take on The Walking Dead was probably one of the more engrossing gaming narratives of the past few years. While many had complaints regarding the arguable linearity of the experience, the game overall did a fine job of enamoring players with a cast of likable (if flawed) characters, often just so it could use them to break your heart a few hours down the road. Leaving gamers with a somewhat ambiguous conclusion, many were dying to know what would happen next in the story. A sixth episode, 400 Days gave fans a brief taste of the future, but wasn't quite the meal that many were hoping for. That in mind, Telltale has revealed it will be making an announcement concerning The Walking Dead: Season 2 tomorrow, October 29th at 3PM (EST). Telltale has previously confirmed that some fan favorite characters will be returning for Season Two. Likewise, players' actions 400 Days will supposedly have an effect on how the new story plays out. Hopefully the coming announcement will shed more light on those potential influences. Even if it doesn't however, we'll be satisfied if Telltale just put a date to the game. While the developer has previously pegged it for a Fall 2013 launch, there's been little news since concerning a specific date. Granted, Telltale fans have had the new and excellent Fables: The Wolf Among Us to keep them occupied, but we'll confess that we're still eager for Season Two to get started. In other words, you can bet we'll have sights set on tomorrow's announcement.